Working collaboratively with Tarkett, a leading global flooring solutions provider, we developed ‘eCampus’; a suite of digital learning in fourteen languages to help increase sales productivity. Tarkett identified gaps in their sales force’s product knowledge which had led to missed cross-selling opportunities. As their sales force is dispersed around the globe, Tarkett decided that digital learning would be the best way to address this issue and improve performance. Tarkett were looking for an elearning solution that would be appealing, informative, fun and, most importantly, that would improve the performance of their sales people. In addition, Tarkett wanted to be able to modify the material themselves and they also wanted it available in fourteen different languages. This was Tarkett’s first experience of elearning and the audience that was being targeted for training had a range of technical ability. Thirty branching scenarios based on the typical sales situations that we had modelled with Tarkett’s top-performing sales people. 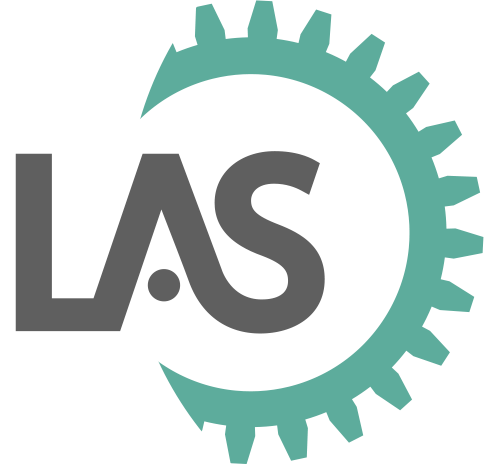 The scenarios allow users to try and fail in realistic situations, observing and reflecting on the results of their decisions and trying different approaches. Nine ‘awareness’ modules which introduce sales people to new product segments. These are informational in format, designed to get the material across in as direct and concise a way as possible. An interactive 3D game to assess users’ product knowledge, where users answer questions drawn from multiple question banks (one for each flooring market segment) to lay a virtual floor against the clock. Sales people are competitive by nature and we wanted to leverage this so they would repeatedly play the game and re-assess. 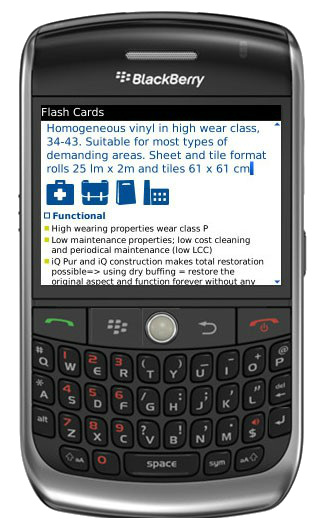 A BlackBerry and desktop app that pulls data from Tarkett’s Product Information Management system (PIM) to provide sales people with the latest product information on their phone and laptop. Tarkett’s sales people can now learn to become top-performers as modelled on the best people in their organisation. 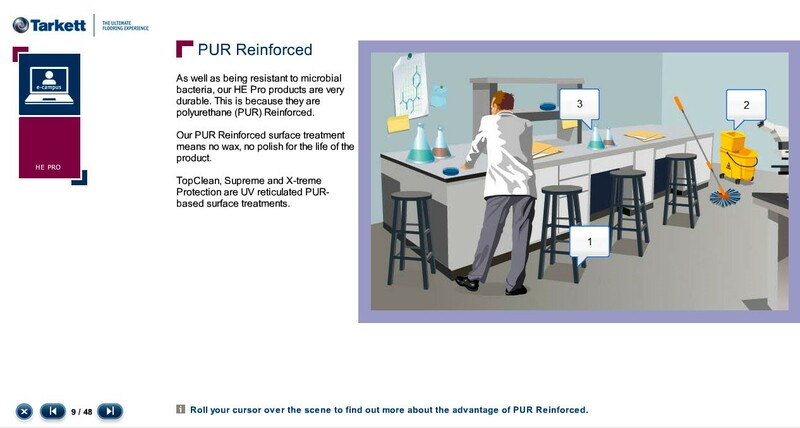 They can learn about new segments they could sell into (via the awareness modules), explore the sales process and hone their technique (in the scenarios) measure their knowledge gain over time (in the quiz) and access up-to-the-minute product information to prepare for meetings (in the BlackBerry and desktop apps). This has led to an increased retention of knowledge, the embedding of new skills and ultimately, improved performance. 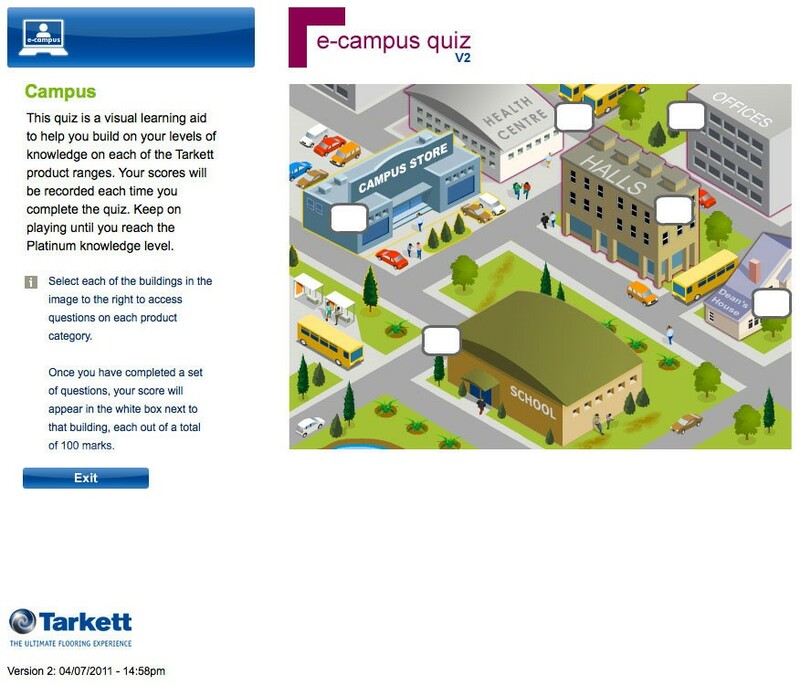 e-Campus was the first experience of elearning for Tarkett and they wholeheartedly embraced it. It has helped demonstrate the value of training and elearning, making it core to Tarkett’s business success and creating an appetite for more. eCampus has been recognised internally within Tarkett with a ‘Tarkett Award’. 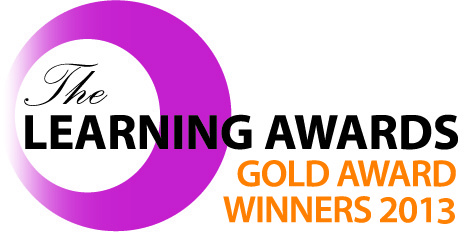 The project also won Gold for Learning Technologies Solution of the Year at the Learning Awards 2013 and bronze in the Best eLearning Project (Private Sector) category at the UK’s 2012 eLearning Awards. Founded in 1886, Tarkett is a worldwide leader in the flooring industry. They manufacture and sell wood, laminate and vinyl floors for the home in over 100 countries worldwide, as well as providing a broad range of products for professional use. Tarkett has 8600 employees, 28 production sites, 50 sales and marketing companies and sells over 1 million m2 of flooring everyday.